In my last post Getting Started with Process Builder – Part 65 (Resolve ALL_OR_NONE_OPERATION_ROLLED_BACK Error), I discussed how to solve ALL_OR_NONE_OPERATION_ROLLED_BACK error by adding all the required fields to Process Builder action. This article goes one step further; it explains another common error – FIELD_INTEGRITY_EXCEPTION Error. The article shows – (1) why errors could occur; (2) how to identify errors (by using a system generated fault email/debug log); and, finally, (3) how to solve the problem. Donna Serdula is working as a System administrator at Universal Containers (UC). UC implemented Case Management a year ago in Salesforce. Serdula has a requirement from her manager that, as soon as a Case gets created without assigning it to an account, then auto assign such Cases to a Low Priority queue. A user mostly encounters a FIELD_INTEGRITY_EXCEPTION error when he populates a lookup field with the wrong Id. For example, while creating a contact via Process Builder if, in the place of AccountId, a user passes an Opportunity record id, then, the user will encounter FIELD_INTEGRITY_EXCEPTION error. Below, I will show you how to avoid getting a FIELD_INTEGRITY_EXCEPTION Error while using the Process Builder. First, I will create a case by passing the wrong ID (may be an account ID) for a Low Priority queue. This will generate a FIELD_INTEGRITY_EXCEPTION error because you are only allowed to pass valid User or QueueID for a case owner. Next, I will show you how to identify the root cause behind FIELD_INTEGRITY_EXCEPTION error followed by a way to solve it. 6. Click on Object node to add object and then select Case object. For the entry criteria, Select only when a record is created, as shown in the screenshot below. Once done, click on the Save button. 7. The next task is to add Process Criteria. To do this click on Add Criteria, then enter Name, Type of action and set filter conditions as shown in the following screenshot. –> As mentioned earlier, the reason behind the error is, we are updating Case record ownership to a Low Priority queue, but we are actually passing Opportunity ID instead of queue ID. 006W00000070lzHIAQ is the Id of an opportunity record. 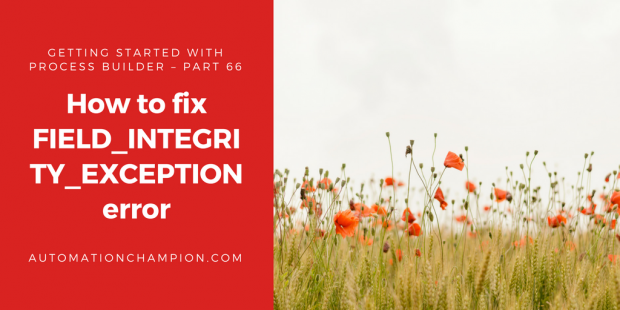 To fix the FIELD_INTEGRITY_EXCEPTION error in a Process Builder or a Flow, you have to pass the correct Id for a lookup field. As we are using Custom Label to pass Queue Id, now we will update the custom label with correct ID for the Low Priority queue. 4. Once done, click on the Save button. Once you’re done, click on the Save button. Notice that, Case is created and assigned to the Low Priority queue by the Process.